The outdoor preschool playground is the perfect place for banging nails and sawing wood. Children enjoy designing and constructing their own wood masterpieces. They also learn to change physical properties like size, shape and texture as they master the tools and manipulate the material. 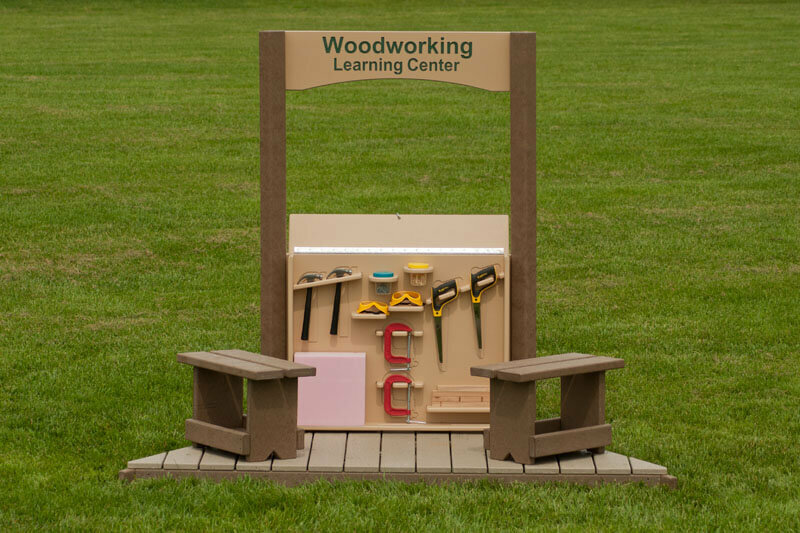 Our preschool Woodworking Learning Center includes a lockable tool storage cabinet, real tools, and two preschool workbenches. 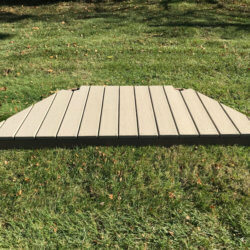 Also available is an optional Floor Add-On. (2) C-clamps, which allow children to clamp wood vertically and horizontally for either sawing or nailing. The wood can be clamped directly to the workbench. (2) Finish Hammers (7oz.) properly weighted and well-balanced for preschool woodworking apprentices. (2) Keyhole Saws are designed with a blade for cutting curves. Typically, children have trouble holding a saw straight, so the blade often bends and gets caught in the wood—bringing the project to a halt. By using a saw that was meant to be bent to cut angles, children can still cut even though they may be twisting the blade a little bit. The Adventurous Child selected the Keyhole Saw so that young carpenters can complete their projects independently with pride and confidence. (2) Styrofoam Blocks and (1) Cup of Golf Tees assist beginner carpenters in hammering practice and developing eye-hand coordination. (1) Cup of nails for nailing wood pieces together. Small bundle of wood pieces for sawing and hammering. (2) Safety Goggles for eye protection. Personal safety is a critical component of demonstrating and teaching carpentry for preschoolers. The lock for the Tool Storage Cabinet is not included.